New Aqua Signal oval grill flush-mount, drop-in horn. 6 x 3 1/8" oval grill (beige). Mounting gasket, instructions and fasteners included. One nautical mile visibility. Stainless steel housing. 10 watt bulb included. Two power leads. Horizontal surface mount. 5 Watt bulb. Overall height: 4". Green light for starboard side of boat. Vertical surface mount. Priced each. Vertical surface mount. Redlight forport side of boat. Compact design fits most boats. Individual red and green side lights. Priced per pair (1 red light and 1 green light). Horizontal surface mount. Polycarbonate housing, lens and base. Designed for small watercraft, dinghies, canoes, row boats, kayaks, etc. that are manually powered or less than 23 feet with speeds up to 7 knots. Built with LED lighting for low power consumption. Housing is made from high quality plastic with a rubber grip that is seawater resistant and incorporates a carabineer clip to allow for attaching to boat with a lanyard. Single LED diode accent light provides as much light output as a conventional 12 Volt incandescent bulb. Built with LED lighting for low power consumption. Produces a bright blue light. Allows for a wide variety of uses in storage lockers, rod lockers, swim platforms, stepwells and more. Low profile surface mount - just a small hole required for the wiring to pass through. Built with LED lighting for low power consumption. Polished stainless steel housing. Two illumination features - warm white or red. Single LED diode accent light provides as much light output as a conventional 12 Volt incandescent bulb. Built with LED lighting for low power consumption. Produces a bright white light. Allows for a wide variety of uses in storage lockers, rod lockers, swim platforms, stepwells and more. STAINLESS STEEL. AEXD LENS COLOR RED. FEAT SPECIAL FEATURES A MAGNETIC,DHI TEST CHARACTER. SHPE SHAPE IRREGULAR. MATT MATERIAL PLASTIC POLYCARBONATE BODY. MATT MATERIAL PLASTIC ACRYLIC LENS. CTXJ LENS SURFACE CONDITION SMOOTH BACK. Designed for small watercraft, dinghies, canoes, row boats, kayaks, etc. that are manually powered or less than 23 feet with speeds up to 7 knots. Built with LED lighting for low power consumption. Red and green lens. Surface mount - just a small hole required for the wiring to pass through. Built with LED lighting for low power consumption. 3 position rocker switch for dim white / off / bright white. Two illumination features - dim white or bright white. Surface mount - just a small hole required for the wiring to pass through. Built with LED lighting for low power consumption. Two illumination features - white or red. 3 position rocker switch for white / off / red. Housing o	High quality, impact and shock resistant polycarbonate o	Non- corrosive o	Non- magnetic o	Seawater resistant Range of visibility o	2 N. mile Brand new, sold as is. Housing o	High quality, impact and shock resistant polycarbonate o	Non- corrosive o	Non- magnetic o	Seawater resistant Range of visibility o	2 N. mile 4 lights available, brand new and sold as is. Individual red and green side lights. Priced per pair (1 red light and 1 green light). Vertical surface mount. Masthead Light. HI, AK and remote/rural areas in the lower 48 states I am happy to work with you within reason. 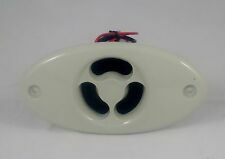 For sale an Aqua Signal hidden boat horn series 84, white, 12 volt, splash proof-water proof. Part # 84401-7. Low profile surface mount - just a small hole required for the wiring to pass through. Built with LED lighting for low power consumption. Two illumination features - warm white or red. 21 warm white LEDs that provide a natural color setting for living spaces. Signal Stern Yellow. Made In Germany. New sealed in the bag. In most situations you can buy a Square Trade warranty on the item for a small fee. 12 volt, 25 watt. Don't see what you are looking for?. Boat part number 1060482 is a NEW, out of the box, 2 Pin Light Base used for both stern and bow lights. This Plug is manufactured by Aqua Signal out of high quality plastic. Part Manufacturer: Aqua Signal. Aqua Signal 25 Allrd White Replacement Light Cover. New Aqua Signal black, round grill flush-mount horn. Mounting gasket, instructions and fasteners included. Series: 40. Light Colour: All Round White. Light Arc: 360 Degrees. Height - 4.75". This product is made of stainless steel 304 and comes with ABS screw in grills with water resistant fabric liners. Grill comes in silver or white colors. This waterproof fabric liners lets sound through but keeps water out. Prewired for 12V DC installation. This horn is designed for easy installation and mounts hidden from the outside. Compact in size but loud and draws 110db loudness. ---Dimension: 5" x 2.5" x 3.7" ---Distance between the holes: 4" ---Horn button rated for 5 amps ---2 screws are included Item: P15036-12SL *Customers please note every computer shows colors differently. All measurements are approximate. New Aqua Signal white, round grill flush-mount horn. Mounting gasket, instructions and fasteners included. Comes with 50 watt, 24° angle bulbs Each light draws 3.3 amps and has easy screw on-off lens for easy bulb replacement Made of tough lexan and stainless steel and fully gasketed at the hull and lens 4-1/4 W, 7-3/4 L x 3-1/2 D Description : White Housing Pack : 1 pr. 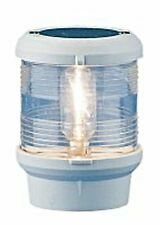 AQUA SIGNAL MONTEREY HALOGEN DOCKING LIGHTS Compact. Stainless Steel covers with easy screw off lens for easy bulb replacement. Includes 50 watt halogen bulb. Sold in pairs. Green light for starboard side of boat. Compact design fits most boats. Horizontal surface mount. Compact design fits most boats. Horizontal surface mount. 1-5/8" overall height. Polycarbonate housing, lens and base. New Aqua Signal round grill flush-mount horn. Mounting gasket, instructions and fasteners included. 1 nautical mile visibility. 12V/10 watt. All housing parts are non-magnetic polycarbonate. 10 W Festoon bulb included. Size: 2.5" x 2.9". 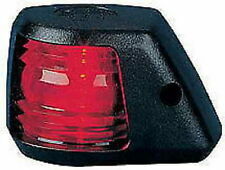 Boat part number 8601037 is a new Pair of Dock Lights, part number 85103-1. Commonly used on Larson Boats, part number 2246-1773. Boat Manufacturer: Larson Boats. These new Aqua Signal Compact Docking Lights are durable, watertight per manufacturer and easy to install. 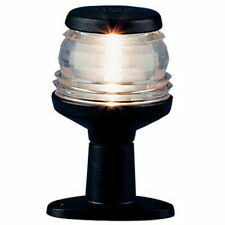 With housing built from high-quality polycarbonate, these lights are impact and shock resistant. FEED BACK POLICY If you don't get it. condition that it left our warehouse. Local Pick-up is also available. New old stock Aqua Signal brand wall mounted nav station light. Can be removed easily from wall mount by depressing lever on mount. Has a switch to go from white to red. 12V. 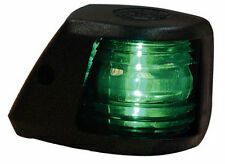 Aqua Signal item nos.25300-7 (port/red), 25200-7 (starboard/green), 112-1/2-degree, 12-point side lights. Currently wired with non-marine zipcord, upon installation should be wired with marine-grade (red/yellow) tinned-copper 14/2. Hide-Away bow light. One nautical mile visibility. USCG approved Patent Number 5268824. 164127 new LED COURTESY / LIVEWELL / BULKHEAD LIGHT, WHITE: LIMA Series 16 by AQUA SIGNAL. low heat makes them safer for enclosed areas. SOLD IN LOT of 2. Quantity of 2 each. 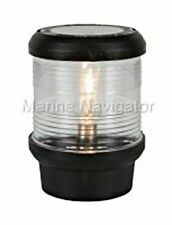 Aqua Signal Series 41 Nav Side Light For Bulkhead USCG (A-16) approved for 2 nautical mile visibility for vessels up to 65' (20 m). Non-magnetic and saltwater resistant. Black housing. Bulb included. Fasteners not included. Size: 3.6" W x 3.2" D x 4.1" H.